An enormous burst of plasma erupting from the sun has had astronomers glued to their telescopes for hours. Two orbital observatories managed to capture the phenomenon on video, published by NASA. The event was filmed with the use of coronographs. They are specialized observation devices which use an occulter disk to block out light from the sun itself and create an artificial eclipse within the device. This enables astronauts to observe the dimmer parts of the star, its corona. Filaments are unstable strands of solar matter which rise above the sun with the fluctuations of its magnetic field. They are much colder than the surface of the sun, and are thus visible as darker areas when viewed against it. However, when seen from the side, like in the video, they look like snake-like bursts of flame, which sometimes loop back onto the sun. This particular filament is unusually large, spanning millions of kilometers. The phenomenon was observable for a span of about six hours (the video has been sped up, but you can see the time stamp at the bottom). It did not erupt in the Earth's direction and poses no danger to the planet or spacecraft in its orbit. It was observed by both NASA and the European Space Agency, using their orbital Solar Dynamics Observatory (SDO) and Solar and Heliospheric Observatory (SOHO). 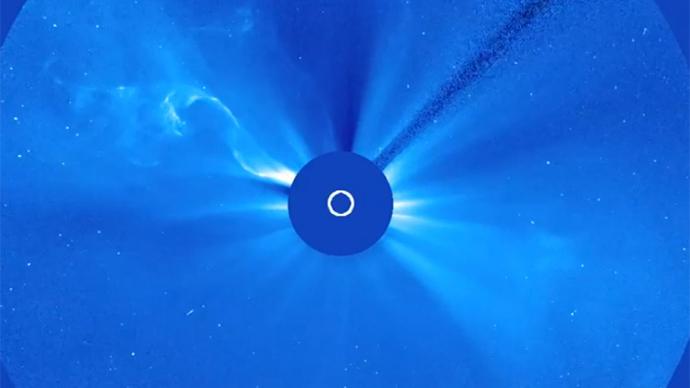 Soho offered the best view of the event through its two Large Angle Spectrometric Coronagraphs (LASCOs) and made it into the video. One coronograph took a closer look, filming the corona out to 8.4 kilometers. Its part is colored red in the NASA video. The other took a wider shot, with a 45-million kilometer pan, colored blue in the video.